It has been a rough few days in the Minnesota Twins minor league system, as they haven’t won a game in the past two days, but I can spoil some of the following for you as the third day was the charm thanks to a walk-off. In addition to recapping the three scheduled games, as the Pensacola Blue Wahoos traveled home for the first time on Tuesday, I was able to catch up with perhaps their biggest fan for the upcoming season. Keep reading to check it all out! The Red Wings fell behind 1-0 after the first inning with right-hander Kohl Stewart on the mound, but quickly gave him a lead in the top of the second. The first four hitters in the lineup reached safely, with Adam Rosales’ single to center field scoring Luke Raley from third for Rochester’s first run. Later in the inning a Ronald Torreyes groundout brought in Zander Wiel for a 2-1 lead. In the top of the third a Wynston Sawyer double brought in two more runs, and Rosales followed with a double of his own to push their lead to 5-1. Unfortunately for Stewart and his defense, their hold on the game unraveled in the bottom half. A throwing error started the inning, then a hit batter, walk, three singles, a double, and a sac fly resulted in six runs for the Mets and they never looked back. All told Stewart was charged with seven runs, though only one was earned, in his 2 2/3 innings. He struck out three. Fernando Romero took over in the third for his second appearance of the season and finished 3 1/3 hitless innings. He struck out four and walked none (did hit a batter) on 40 pitches, with 25 going for strikes (63%). Jake Reed got the final two innings, going one-two-three in each, along with picking up three strikeouts. The Rochester lineup out-hit Syracuse 14-7 on the game, but after the third inning it was all about the pitchers for both teams. Eleven of the Red Wings hits came in those first three frames, as did all seven for the Mets. Six Red Wings batters picked up multiple hits including John Andreoli (2-for-4, BB, K), Randy Cesar (2-for-5, R, K), Raley (2-for-5, 2 R, 2 K), Zander Wiel (2-for-5, R, 2B, 2 K), Sawyer (2-for-2, R, 2 2B, 2 RBI, BB), and Rosales (2-for-4, 2B, 2 RBI). Wiel and Brent Rooker also collected their first doubles of the year. Pensacola finished their first weekend of the Southern League season by taking three of five against the Mobile Bay Bears on the road. They headed home to Blue Wahoo Stadium for the first time in 2019 on Tuesday for a five-game series with the Jacksonville Jumbo Shrimp with fireballer Jorge Alcala on the mound, who struck out six in five scoreless innings in the team’s season opener. When they get there it also will be the first time fellow Minnesotan and Blue Wahoos PR Director Daniel Venn will get to see them in action at home as a Twins affiliate. With the off day, I caught up with Daniel about what he’s looking forward to covering the team this year and the prospects he will get know. 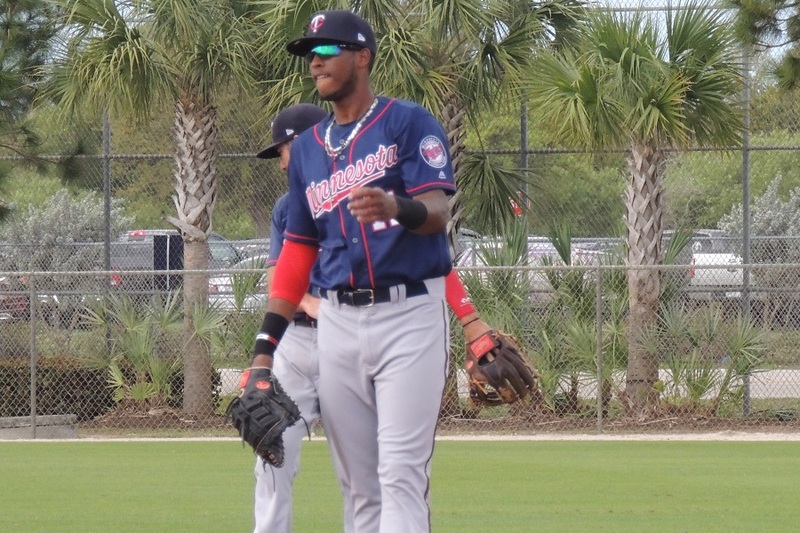 Twins Daily (TD): Who has been the best prospect you’ve seen come through since you’ve been working in the minor leagues? Daniel Venn (DV): Both in the FSL and in spring training this year, Alex Kirilloff blows you away. I watched him twice this spring, once facing Blake Snell on a minor league backfield. The other against James Paxton and the Yankees at Hammond Stadium. Both times it was lefty-on-lefty, a tough enough match-up as it is, against two of the best left-handers in baseball. Against Snell, he stepped in and hit a wicked liner to left. Against Paxton, he flew out to the warning track. Even though both were outs, to see a kid with no experience above High-A step in, have great at-bats, and hit the ball hard against two elite-level major league pitchers is really impressive. I can't wait to watch him this year. DV: A couple guys who aren't considered 'top' prospects have really impressed me. Jimmy Kerrigan and Taylor Grzelakowski are two guys who might make it to the major leagues on grit and will and hard work alone. Both were undrafted and came out of independent baseball and play their hearts out every night. Twins fans should also know the names Devin Smeltzer and Griffin Jax. Both are great pitchers, great people, and great stories. Devin beat cancer as a young athlete and has dedicated his career to helping kids battling the disease. He took a perfect game into the fifth in his first outing of 2019 and K'd 9 in 5.2 IP. Jax is a second lieutenant in the US Air Force and missed most of the first two seasons of his career as an active duty member of the military serving his community. He's still active duty, but was able to resume his baseball career last year through a World Class Athlete Olympic exemption. TD: Who are you most excited about to see on the roster at the beginning of the year? DV: Obviously I'd be remiss if I didn't name Kirilloff first. I can't wait to watch him get back on the field and start hitting. He's such a mature hitter who just barrels everything up and never gets cheated on a swing. I'm also excited to watch this team's starting pitching every night. To have Alcala and Brusdar at the top of the rotation each throwing 98-100 is a luxury not many minor league teams have. But, then to have Devin Smeltzer, Griffin Jax, and Sean Poppen follow them? That is a deep, deep rotation that should put this team in a position to win every night. TD: What does it mean to you to have your “hometown” team be the parent club now? DV: It sounds cliche to say I have my dream job, but I really do. Following the Twins avidly as a fan, I've been checking box scores for years to see how guys like Royce Lewis and Alex Kirilloff and Luis Arraez and Brusdar Graterol do. Now they're part of my day job. It couldn't be more fun. TD: And finally, do you have a prediction for how the Blue Wahoos will do this year? DV: The whole Southern League is full of talent, but I like this team's chances. It takes high-end prospect talent to win in the minor leagues, which we have in guys like Kirilloff and Arraez and Graterol and Alcala, but it also takes some older, experienced guys who will grind for you all season long, and we've that too in Drew Maggi, Brian Schales, Grzelakowski, and Kerrigan. It takes a team and we've got that. Plus, if you take a look down a level at Fort Myers...they're absolutely loaded with talent, especially offensively. Knowing that at some point this season, there will be a wave of talent coming up from the Miracle also makes me really excited about Pensacola's chances this season. Big thanks to Daniel for taking the time to answer some more questions! It was a pitcher’s duel at Hammond Stadium on Tuesday night, with right-hander Randy Dobnak getting the start for the Miracle and his Florida State League debut. He went five scoreless innings, scattering five hits, walking one, and striking out two. Of his 89 pitches on the game, 54 went for strikes (61%) including 10 swinging. Hector Lujan came on for the sixth and went the next 2 2/3. He allowed one hit and struck out four including Vladimir Guerrero Jr. in the eighth. But after consecutive walks, Tom Hackimer was brought in to snuff the threat and after loading the bases by hitting a batter, did so with a big strikeout. He finished the game by striking out the side in the ninth, but at that point the score was still tied at zero with the top of the lineup coming up for the bottom half. Diaz was the only hitter to collect multiple hits on the day for the Miracle, while Travis Blankenhorn added a double. Cedar Rapids got a strong first four innings from their starter Luis Rijo, but after an error started off the fifth, he got a little wild with two hit-by-pitches around a two-run double and an RBI single that put Kane County out front 3-0. In his five innings, Rijo allowed three hits and a walk while striking out six. The Kernels got one back in the bottom half when a Gilberto Celestino double drove in Michael Davis who had walked a batter earlier. But that’s all the offense would be able to muster on the game despite outhitting the Cougars 9-5 as they were 0-for-7 with runners in scoring position. Celestino (2-for-5, 2B, RBI), Chris Williams (3-for-4, K), and Trey Cabbage (2-for-4) each had multiple hits. After Rijo was done, it was right hander Tyler Palm who came out of the bullpen. He finished the final four innings, allowing one run in the ninth, but otherwise just two hits and two walks to go along with four strikeouts overall. All of that and Stewart only gets charged with one earned run. Sometimes the stats are kind. Great to see that very good outing by Romero.After all, he is the one prospect close to joining the Twins who could make a real difference for the big club this year! Great interview and yes, it sounds like he has his dream job.I know I sure as heck would like to spend my winters in Pensacola getting ready for opening day.And after reading that interview I am almost more excited about Kirilloff than I was before reading it.Can this kid really be this good?And if so, when will he be back on the field and when will he arrive in Minny? I was honestly trying to figure out why reading the box score. They say any run scored after there should be three outs is unearned, but I didn't like how it applied in this scenario. The first runner of the inning reached on an error, so that one unearned for sure. But after that I don't see it. I would have thought in a case like this, it's the potential third out that needs to be the qualifier, not the potential first out. But it will certainly help his stat line! I was never a Diaz backer.Thought it was a bad pick but what this guy is doing is changing my mind.He has really slimmed down which should help him defensively.He seems to have a decent eye at the plate and he makes good contact.I really like what he has done and it shows he is serious about trying to make it to MLB.I am cheering him on this year as he needs a big year to regain the prospect status he has lost.He is off to a real good start.I hope he keeps this up. If the first batter was out, then the third out would have come on the sac fly which scored the first run... so yeah. I do sort of feel that if a batter reaches base after the third out would have been recorded, and then still comes around to score that those should start to count again, and there were a couple of those. Bottom line is that there are 3 or 4 stats to look at before ERA. It also doesn't seem like Stewart pitched terribly overall. It was pretty much one ground ball through the infield after the next, but it does seem like he came a bit unglued after the damage started. Yeah, that's what I'm getting at as well. I understand it, just don't necessarily agree with its application. Hope this is not a trend for Stewart.Unfortunately it has for Gibson in his two starts with the Twins.Walked the #9 hitter in KC and became unglued, and could not get out of the 5th with a large lead yesterday. The encouraging thing for Romero was "only" 40 pitches in 3 innings and zero walks. Strike % was up a bit, 3-ball counts were down. More of that, and we're in business. Discouraging for Stewart, but I don't think hugely discouraging. It was kind of the perfect storm of what his challenges will be, and what we already know them to be. He couldn't finish guys off with K's when he needed it most...and all the balls in play, despite only a couple of hard-hit balls, resulted in multiple consecutive hits. The more I think about Romero's outing, I am excited for how he was used.Going 3+ innings tells me they are stretching him out to be used in long relief. Once he has done this for a half dozen games, and assuming he continues to pitch very well, he could be brought up to fill a similar role with the Twins.Already have seen a couple games where he would be invaluable in that role.Further assuming he settles in and does well with the Twins, he could then slide into a starters role later in the year should one of their five starters go on the IL.